I’ve had a frustrating relationship with Passaggio Cravatte. Gianni, who runs it, is a young guy, very keen, very inventive and with some good people making his ties in Naples. It is a sign of his ambition that he has started making entirely one-piece ties – the original seven folds, that require a piece of silk around 2m x 1.5m. Most seven-folds do not use just one piece, and indeed are three-folds through the centre of the tie (eg Marinella). The tie pictured here is the seven-fold he made for me. The silk is nice – some of the vintage fabrics he works with are not as appealing – but unfortunately not suited to this construction. Original seven-folds are unlined, which means the silk has to make up for that lack of structure with its own thickness. 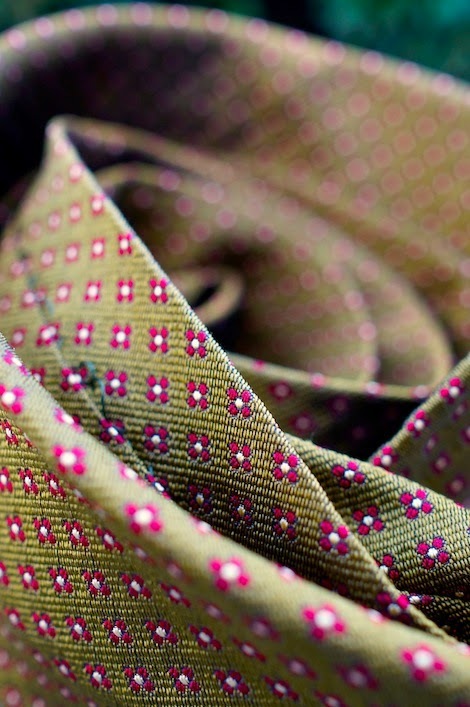 This woven silk is too light, meaning the tie twists when worn. It has also been rather overpressed – as you can see from the image below. In my experience, printed silks are more suited to a seven-fold, and heavier silks in any regard. Gianni has made me unlined ties before in such printed silks that have worked well. Which is the frustrating thing. I have had some great things from Passaggio and some not so great. One tie he made was lovely, except for the fact that the keeper was so far up the front blade that it interfered with the knot. The making on the tie pictured here was also a little off, with the join down the back of the tie wonky in a few places. I know how hard it is to make a new product, and work with new craftsmen. Here’s hoping Gianni can achieve greater consistency in time. You can follow the discussion on Pleasures and problems with Passaggio Cravatte by entering your email address in the box below. You will then receive an email every time a new comment is added. These will also contain a link to a page where you can stop the alerts, and remove all of your related data from the site. Interesting article though i can see you are somewhat frustrated, and understandably so. On another subject altogether, can i pose a question that is troubling me and that is to do with trouser pockets. I have my trousers made with slanting pockets and one thing i cannot get my head around is the area of fabric that is within the pocket. Not the white lining bit but the cloth that matches the trousers. The area where it joins the bottom part of the pocket always seems to be excessive thereby creating a loose fold and breaking the line of the entire side of the trouser (if you require a pic for clarification then please let me know and i can send one on to you). I have spoken to my tailor who ensures me there is little that can be done however, the italians, they say, have a system whereby they sew the pocket on to the front inside of the trouser and this ‘lifts’ the fold and removes it. I hope i am explaining this well since it is difficult to do so. My question to you is why is this happening and can it be designed out and if so how? Nuisances like this should not occur with bespoke surely. Hi Bradley, I’ve never had that problem to be honest. I certainly hadn’t noticed it previously, and I checked just now on my trousers and can’t see such a problem. Perhaps it is just an issue with the individual tailor? I thought you were pleased with the result of the collaboration you did with him? How would you compare his ties with those made by Drakes? I was, largely. The ties made for me were good and I heard good things from others. But then there has been inconsistency since. Drake’s is very different. Innovative in design and materials, yes, but without the same restless experimentation. It is a large, professional manufacturer, with necessarily tight quality control. It makes consistently good ties, and only changes to new designs – such as untipped over the past few years – slowly but surely. I had a frustrating experience with Passaggio Cravatte too. I paid for 5 “old seven-folds” but they sended me, SIX MONTHS LATER, three pieces ties. All the ties are different and have different long and measures. I don´t recomend this company.